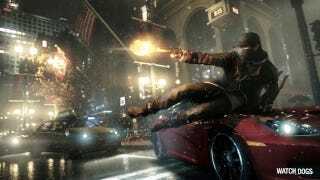 We're still guessing about whether Ubisoft's highly impressive Watch Dogs is in fact one of a few of E3's stealth-reveals of the next generation of gaming. What we saw sure seemed too intricate and advanced to run on current gaming consoles. But Ubisoft has remained cagey about when and on what platforms the game will be released. So, "consoles," eh? That's as cagey as Face/Off, is what that is. That's Cagier than Leaving Las Vegas. In other words, other than that 2013 bit, we don't really know anything new. But hey, that's something.